"Like what the place has done with me?" "What the hell is that? It looks like the ground there is alive..."
Usually occurring in sci-fi works, Meat Moss is when an inorganic, usually mechanical, structure is overgrown with a thick meaty biomass. The origin of this tissue can be the bodies of victims altered by The Virus or a particularly aggressive form of Alien Kudzu, or it could even be the "natural" state of a Living Ship. The end result is always, however, the disturbing architectural counterpart to the Cyborg. An excellent way of saying "This is The Virus's territory" or "The heroes are on a techno-organic spaceship", though it does raise questions as to how this biomass is sustaining itself, as well as its purpose other than as set decor. This, in turn, however, makes it also an excellent way to demonstrate that you're in an Eldritch Location or some other place where the usual rules of reality don't apply. The Rule of Scary and the Rule of Cool go a long way toward maintaining the suspension of disbelief. This tends to overlap with Wetware CPU, particularly in the case of the Living Ship variant, in this case the tissue itself being the wetware in question. In more benign settings, may involve a somewhat squicky BrainComputer Interface. Frequently used for evil settings thanks to one of its parent tropes, Evil Is Visceral. When it's divine punishment, you have the Bloody Bowels of Hell. Sufficient amounts of meat moss can also result in a Womb Level. In the most unsettling and disorienting forms of Organic Technology or Worlds Of Chaos, Meat Moss may be intertwined with Alien Geometries. Compare Festering Fungus, which displays the same traits in vegan form, and Transformation Horror, which can resemble this on a smaller scale, and ultimately lead to this if allowed to progress unchecked. Compare/Contrast Mordor, which may contain this sort of twisted lifeform, or none at all. A subtrope of Body Horror. Depending on how amiable they're feeling, the interior of more evil Living Ships in Lost Universe can suddenly shift from their normal ISO Standard Human Spaceship to sprouting squelching masses of tentacles. All over the place in A.I.C.O. -Incarnation-, and integral to the premise. A large section of Tokyo has been evacuated and cordoned off due to an outbreak of "Malignant Matter", which is basically hostile, semi-intelligent Meat Moss that spreads like wildfire and can only be harmed with special weaponry. In Tokyo Ghoul, the secret entrance to a laboratory is an organic "wall" that had been painted to match the surrounding structure. Kaneki discovers it entirely by accident, when he strikes part of the wall with his kagune....and it reacts by revealing a fleshy tunnel. The others in his group mention that such "technology" is a trick ghouls have used to make the underground 24th Ward a labyrinth difficult for humans to navigate. Near the end of the series, a scouting party sent to the investigate the deepest parts of the 24th Ward discovers the ruins of the original Tokyo, covered in the petrified remains of an ancient biomass. The Sandman has a particularly horrible incident in one of the early issues where rogue dreams have converted a still living man into this and draped him all over the walls of his dream-junkie daughter's apartment. A heartwarming example in Stormwatch: a village is accidentally hit with a biochemical that can activate superpowers (or it's intended to, and at least radically alters the human body). When a team is sent to investigate, they find the church overgrown with this, with a fleshy beacon outlined with fingers. One of the team figures out that those affected by the biochemical evacuated the other villagers there and then covered them over as they mutated into Meat Moss, and pulls it away to reveal the survivors. Thousand Shinji: One of the rooms of the Black Moon was coated in pulsating, quivering organic tissue. Living Hell can be considered the ultimate example. The plot of the movie is about a viral corruption that feeds on energy to grow exponentially. It threatens to engulf the Earth if it is not stopped before the sun rises. In the Pirates of the Caribbean series, many of Davy Jones' crew end up becoming literal parts of the ship, able to talk (sometimes) but not move. Carrying on the Body Horror-laden traditions of the original, Aliens features a particularly gruesome and memorable version when the marines are searching the infested colony on LV-426. Subverted in that it's not flesh, but some sort of hard resin. Some decorates the bridge of the Event Horizon, although a skull fragment amongst the gore is meant to imply that it's all that's left of the original crew. Red Weed in The War of the Worlds and one or two film adaptations thereof. The Vord in Codex Alera, being Expies of the Zerg, live on a substance called croach, which has a waxy consistency. Its main purposes seem to be storage of nutrients (like beeswax) and to sustain within itself an atmosphere that the Vord find ideal. Greg Bear's 1985 novel Blood Music. A rare benevolent example occurs in A Fire Upon the Deep; the Old One filled one of the rooms of the Skroderider's ship with this. It turns out to be a complex biotech weapon used to combat the Blight. The buried tower in The Southern Reach Trilogy, which is made of living tissue. It's able to hide its true nature to a degree and appear as stone to the casual observer, but people who have been "contaminated" by Area X are able to see it as it truly is. In The Expanse, areas infected by the alien protomolecule end up covered in this, absorbing anyone unlucky enough to be there at the time. After the Polypond War in The Well Of Stars (a Great Ship novel), the outer hull of the Greatship was covered in the living ocean that made up the Polypond. In the short story Hatch, scavengers prowl above the now mindless ocean of the Polypond, hunting down the fantastic creatures that periodically spew out of it to extract the rare elements necessary to keep their isolated civilization afloat. In the tie-in novel BioShock: Rapture, this was the unfortunate result of one of Tennenbaum and Suchong's wilder genetic experiments. They had tried to give a man the powers of a sea creature; instead they gave him the power of being wallpaper. The description puts the Body Horror in the game proper to shame. In the Battlestar Galactica reboot, the Cylon Basestar's landing bay Boomer delivers the nuke to (shortly before she shoots Adama) has this look. Justified in that Cylon Basestars of this type are implied to have major biological components, and their fighters are biologically controlled. The inside of their fighters looks like this as well, as seen when Starbuck crawls inside one she shot down in order to pilot it back to the fleet. In the Doctor Who episode "The Witch's Familiar", it turns out that the sewers of Dalek cities are lined with Dalek tissue that's too decayed to be useful. They're also fully aware of this, and very angry with the living Daleks who put them there. In the Helix episode "274," adding growth factor to a petri dish of monkey blood infected with The Virus results in an explosive growth of black biomass that coats and fills a small observation chamber and threatens to shatter it until veterinary pathologist Doreen releases Deadly Gas therein. In Stranger Things, the Upsidedown is a dark version of our world filled with this. It's also prevalent around its portals. A carpet of rotting flesh covers the ground in Grixis. In New Phyrexia, the interior of the completed Lumengrid is covered in pulsating, organic tissue. Warhammer 40,000 has the Screaming Gallery, a carpet of living, screaming faces in the throne room of rebel primarch Konrad Curze. More generally, this seems to be the default for daemon engines, which are constructed with (generally) inorganic materials as a vessel to summon and bind a daemon into. Once possessed, the daemon will do a certain amount of "redecorating" to its host form (as much as its bindings allow,) often coming to resembling a nightmarish fusion of machine and living creature. In Vampire: The Masquerade, many vampires of Clan Tzimisce use their magic fleshforming abilities (flesh and bones, actually) to sculpt humans or other vampires into screaming furniture and living decoration for their lairs, which results in this trope. The Tzimisce Antediluvian itself is an example of this trope, having taken root and grown into a miles-long fleshmass infestation underneath New York. In the Tharkold realm of the TORG RPG, Technodemons use alteration magic coupled with their reality's perverse World Laws to produce what they call pain sculptures and pain gardens: living beings melded together, with their responses to pain and pleasure magically reversed. The end result is a writhing mass of gibbering, screaming flesh which gains pleasure from receiving pain and inflicting it on others (including other bits of itself), but agony from doing biologically necessary things such as eating. Until it was Jossed by Notch, Netherrack in Minecraft was thought to be this, or blood covered stone. It's actually just Red Stone with moss on it. Many custom texture packs still take that interpretation and run with it. [PROTOTYPE] has Hives which are buildings covered inside and out in a red biomass. It does in fact serve a purpose: strengthening the Hive by weaving through and around the buildings' walls, to protect the creatures growing inside. The Shadow from Amnesia: The Dark Descent leaves a tough leather-like mass similar to muscle, that can even pulsate in places. Standing on it for too long hurts Daniel. The Flood from Halo do this to heavily-infested areas. In the Halo 3 manual it's implied that they do this to collect enough organic matter for the shapeshifting "pure" Flood forms that aren't based on an infected body. In early stage or contained infestations, the effect is usually just a few cocoon-like clumps in the corners, but in Halo 3, we get to see an entire city-ship that the Flood has had full control over for quite some time, even converting the doors into sphincters. Zerg Creep from Starcraft: Zerg buildings can only be built on the slowly spreading creep and they have an entire building tree of turret-analogues dedicated to spreading it (because both Zerg and Protoss have similar building mechanics, Terrans end up being the oddball race which can put buildings anywhere). It is stated that Creep is used as food for Zerg larva. The infested Command Centers do play this one straight though. In-game fluff describes Zerg buildings to be literal organs and Zerg "bases" as whole a literal organism. So creep is somewhat closer to a fluid circulation system - it's required to keep the organs saturated. Infested Terran buildings are somewhat justified in that Zerg cannot manipulate tools, so they need the entire thing hardwired into their command network of telepathic overlords to make any use of it. Zerg creep is vital to Zerg biology. Minerals and gas are "digested" at the central Zerg organ (Hatchery/Lair/Hive) and then fed to the other organ-buildings in your base through the creep. Without the creep's nourishment, these organs slowly starve and fail. Zerg units can also be fed in this manner - being on creep boosts their metabolism, making them move and regenerate faster. Certain units (like the Queen and the Hydralisk) have their "feet" specially adapted to moving on this creep as well. In game, when playing as a non-Zerg race, it is usually safe to assume that creep = Zerg territory, and that they can see everything you're doing on while you're on it. Parasite Eve uses this trope every now and again. It's especially noticeable in post-game content. Resident Evil 4 has this caused by Las Plagas. Surprisingly, it doesn't show up much in other games. Pretty prevalent in Resident Evil 7: biohazard. There's black gunk growing everywhere and it can spawn monsters called "the Molded". Doom 3 features a red, meaty growth gradually taking over the base - Sarge even describes it using almost exactly those words. The original Doom game had areas with a red, slowly pulsing texture on the walls that was meant to invoke this, but with the game's very limited resolution it wasn't entirely clear. Phazon from the Metroid Prime Trilogy. Phazon is an unusual blue substance with biological properties. It grows like a fungus or plant and the space pirates process it into other solid and liquid forms we see for use in weapons and biological experimentation. It is also hinted to have some form of lower intelligence akin to hive minded single-cells, which in large enough groupings (such as the freaking PLANET made of the stuff) can become sentient. The DomZ from Beyond Good & Evil mark the things they've taken over with long, dark green tendrils. Everything from machinery to people. Dead Space - it's growing all over the ship. According to the Apocalyptic Log, the scientists figured it was a 'habitat modifier' - in other words, terraforming. The good news is, it turns out they're wrong. The bad news is, that moss is actually the dust - that is, shed human skin cells - on the ship being converted by the Necromorph virus. Breath of Fire IV. You'll eventually come across a false Endless made from Nina's sister. To reach her, you'll have to climb through the bowels (heh), of a building slowly being filled with her presumably still-living flesh, eventually leading to a brief Womb Level. Dragon Age: Origins features this trope in the Circle of Magi tower as a symptom of the abominations' presence. Red and pink-colored chunks of meat, complete with short spikes, are beginning to cover the pillars and walls of the tower. The corruption gets worse as one goes higher into the tower, and if the music isn't playing, you can hear the squelching noises of the Meat Moss as it grows. The similarity between this and the corruption left by the darkspawn is noted by at least one companion. In Fallout, you find loads of this stuff at the bottom level of the Cathedral's vault. It's part of the Master, who's been mutated by FEV into a Muck Monster. In Final Fantasy V, Exdeath's Castle after the illusion is dispelled. things. You have to traverse an actual Womb Level to get to it. Appears in System Shock 2 and gets worse and worse as you near the body of the Many. It starts with some veining on the walls of the vessel, then goes on to blobs of biomass, and continues like this until whole levels are made of biomass and there are just a few objects and rooms that have survived the assimilation. Computerised doors also begin to disappear around this stage of the game, as they are replaced by biological, Dilating Door-esque flesh gates, which are referred to in several audiologs as "sphincters"
And also in the original System Shock, though it's justified by it appearing in Beta Grove (simulation of a park, so it has the necessary equipment for plant life). No such justification for the biomass covering much of the interior surface of the bridge module (SHODAN's final stronghold), which is an unhealthy-looking white, like mold or fungus. Possibly subverted in Resistance, in which you encounter growths that appear to be this. Only for them to explode, revealing themselves as egg sacs full of the game's Goddamn Bats. Seen in the Dark Worlds of the later Silent Hill games. In The Legend of Zelda: Breath of the Wild, organic outgrowth called Malice can be seen in different areas as a result of Calamity Ganon's corruption. Sometimes this growth has eyes and fanged mouths. Beast-Subverted ships in Homeworld Cataclysm are covered in these. They're organic computers made from the unlucky ship's unluckier crew. The Marathon: RED total conversion has these areas infected by The Virus. Present near the end of Beneath a Steel Sky, seen as evidence of the "evil under the city" once the protagonist descends below ground level. It is even involved in a couple of puzzles. Aquaria has this in the Mithalas Cathedral-level. Evolva: The towers you have to destroy in several levels? If you watch the initial cutscene, you'll see that the Parasites create them through dilatations from its tentacles. Which means they're made from the same matter as the tentacles. Warframe has various ships infested with the Technocyte plague, which deforms its victims into horrible, metallic monstrosities. Any ship with the plague present has disgusting patches of slug-like cilia. The Infested Ship tileset is a shattered Corpus freighter which has been completely overrun by the Technocyte plague; huge gray and red growths cover most of the walls, and interfere with the ship's gravity generators. Certain Bydo-infected ships from R-Type. In Command, it grants them a Healing Factor. The final level in Phantasy Star Online has the player descending into spaceship that was buried in the ground in an attempt to seal away a great evil. As you keep going the metallic walls gradually become more organic until the the whole level feels more like you're walking through a living creature. Terraria has the Wall of Flesh, a powerful end-game boss. The 1.2 update introduced the Crimson, a variant on the Corruption that replaces the dark-themed monsters with flesh-and-blood themed ones such as the Blood Crawler and the Face Monster. 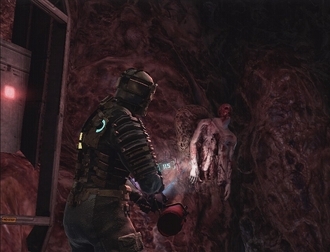 In Metro 2033, D6's reactor level is absolutely covered in a thick layer of Biomass, which spawns Giant Amoebas and acts as a boss monster. UFO Aftermath has the Biomass, an organic growth set in place by Planter ships that will take over your bases if it reaches them. It spreads astronomically fast, and you lose the game if it spreads across he whole planet, but you find a way to counteract its growth not too long after it's first spotted. Evil biomes in Dwarf Fortress can have writhing fleshy 'grass' or blinking eyeballs on stalks in lieu of more traditional ground covering plants. Your livestock will happily graze on it nonetheless, until one of the biome's other hazards destroys everything. According to Word of God, the Meat Moss in Lone Survivor is actually just moss, but it's made to invoke this trope because of the low-resolution graphics and lighting. Zombie ships in Space Pirates and Zombies are a mass of human ships glued together with the stuff. In Star Control, the Umgah ships appear to be fully organic, but they aren't. They're plain old mechanical starships whose interiors are completely covered in living, fleshy organic material. This is one case where the Meat Moss is not a sign of malevolence: it's a little creepy, but the Umgah only do this because they enjoy tinkering at all times with bio-engineering, and this gives them plenty of material to work with. Rage has sections of the hospital level covered in a growing...something. Its implied it has a connection to the mutants but not explained. The penultimate missions of the games' namesake in Darkest Dungeon echo this. While the first mission features relatively-unspoiled yet foreboding obsidian architecture, by the time of your second excursion these structures are saturated with bulbous, toothy, eye-covered growths; products of the Heart's exponential, otherworldly growth. It gets worse; by the third mission, there is nothing left around you but throbbing flesh, as you fight your way through the creatures' cosmic bowels. In these same missions, the Meat Moss can take shape as enemies in combat; writhing, patchwork amalgamations of flesh and architecture that can move and react to your attacks just as easily as any ambulatory foe. Enjoy! The final dungeon in Dragon Quest VII, the Cathedral of Blight/Dark Palace, looks like the inside of a demon, complete with fleshy walls and floors, bone-like structures, and rooms that look like organs. In the PS1 version of the game, the party can even be transported to other parts of the dungeon by means of a fleshy mouth-like organ that swallows them up and spits them out elsewhere. Scorn can pretty much be called "Meat Moss: The Game". The direlict ship in Environmental Station Alpha has various piles of pulsating flesh that damage you when you touch it. There's several patches of this around the facility in Ruby Quest. Guess what the "cure" was made from? The Dogscape. Literally everything on Earth has turned into parts of dogs. Trees, fruit, oceans... everything. The Horror from the Vault has the titular creature create this, infesting a clearing in the woods it calls home with it. It's made from animals, all somehow still alive and trying to escape despite having all their bones and organs removed. It also creates pods of flesh-covered organs containing a stem culture that keeps them alive, which can begin spreading if nourished properly. The scientis whom discovered this had to burn the samples when they subsumed a lab table. From Welcome to Night Vale: The radio station sound booth in Desert Bluffs is covered, and made out of bloody flesh. The ship in A Shock to the System is infested with "a greenish biomatter" that looks like both meat and mould. It's quite common in the SCP Foundation, with the most well known instance being SCP-610: "The Flesh That Hates" . In Mortasheen this can be any of the following: fungi, bacterial mats, bloodsponge, snotmoss, barnacle maggots, cancer, eyes and possibly crabgrass, which may be just normal crabgrass, but given the setting probably consists of real crabs. The inhabitants often cultivate these substances outside their houses as lawns (and has a biomechanical lawnmower-beastie to keep them at the right length). Troll nests from Stand Still, Stay Silent are like that. Deep Rise takes it to the logical extreme in the form of Flesh Fields. The bottom floors of Project Cadmus in the pilot of Young Justice appear to be made (or covered) in some sort of biological product. It's not quite clear why, since the floor in question also had working (and fully metal) elevators and bank-vault-esque doors, as well as a metal floor in the room for Project Kr. It's possible that it was meant to be an incubator for unborn Genomorphs. Alien Species Wiki's Habitat Modifier entry. Several varieties of mold can give walls this kind of look. Biofilm is basically loads of bacteria that have had a population explosion, and due to the nature of bacteria, are extremely resistant to medicines, as the outer layer absorbs the chemical, dies, gets eaten, and replaced. It usually grows on medical implants and teeth. Fortunately, as of yet, they can't form Combat Tentacles. Exceptionally thick biofilm, called a microbial mat, covered the bottom of most of the ocean for much if not most of Earth's history (starting fairly soon after the beginning of microbial life 3.7 billion years ago). The mat only disappeared in the Cambrian (about 600 million years ago), when animals learned how to burrow into the sand (which broke up the mat by opening up channels for oxygen to permeate the soil, poisoning the anaerobic bacteria). Snottites, icky cave formations that are actually bacterial colonies feeding on the mineral water dripping from the ceiling. The so-called Raleigh Sewer Monster certainly gives off this sort of effect. They're actually large masses of tubifex worms that group together in the absence of natural soil. And as for why they're pulsating like that, they're photosensitive, so they're recoiling from the massive amounts of brightness and heat from the camera. Poor bastards.